Need help figuring out what to get your dad for Father’s Day on June 17? Here are a few ideas to make shopping a bit easier for you. Keep checking back, I’ll feature plenty more until the big day. If your dad still has stacks of vinyl records from the Ice Age, but nothing to play them on, you could put a big smile on his face this Father’s Day with the latest turntable models from Pyle Audio that cleverly blend retro with new tech. 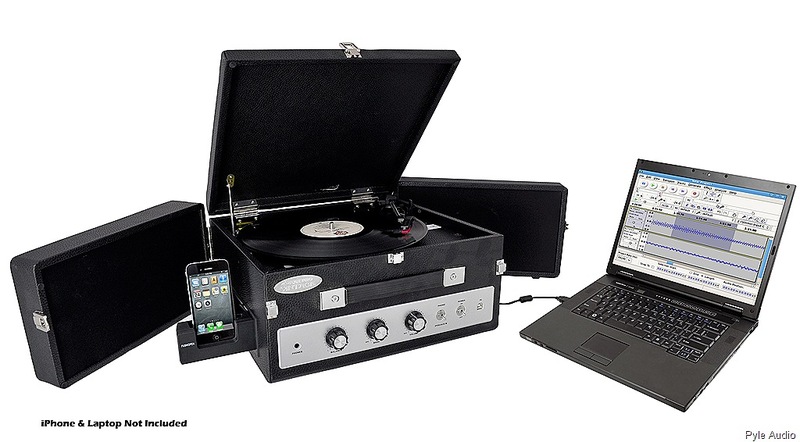 Not only do they spin records, but the handsome turntables feature USB ports allowing dad to transfer his analog music to digital files. Some play CDs and MP3s, and others include a built-in AM/FM radio. Take a look. 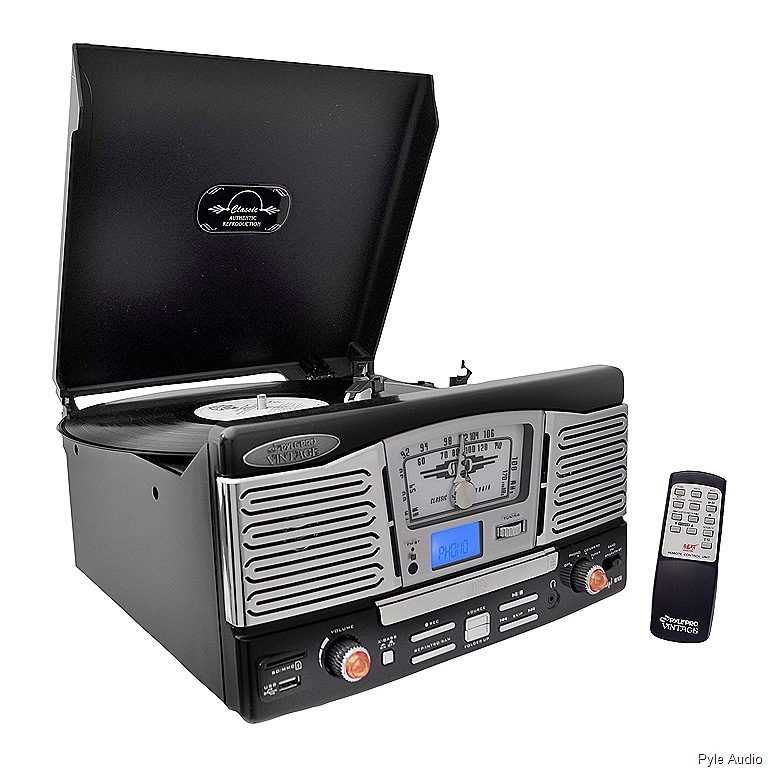 The curvy PTCD8US two-speed retro style turntable plays 33 and 45 RPM records while giving a nod to high tech with a wireless remote and built-in USB and SD card slots. It also sports an AM/FM radio. Perfect for the dad who appreciates classic styling with new technology. It’s available in black or silver through amazon for $131.78, free shipping with Super Saver Shipping. If your father has a bit of Gomez Addams in him, then the PTCDS5U, which offers the same features as the PTCD8US above, but with a Gothic bent, might be just the ticket. Also available through amazon, $156.52, free shipping with Super Saver Shipping. 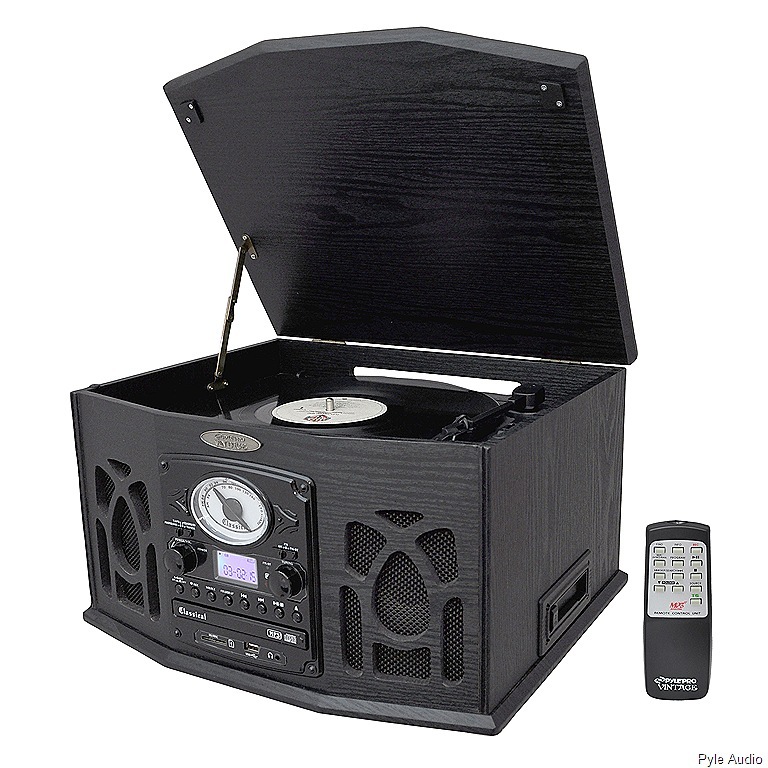 All of these turntables are available with gift wrapping, and you can have them delivered directly to your father’s doorstep. Your dad can be the first on his block wearing Griffin Technology’s just-launched eco-friendly WoodTones earbuds with polished housings made of reclaimed wood from furniture manufacturing. Just think, maybe a tiny piece of someone’s dining room set went into making a pair of these earbuds. Unusually good looking, the earbuds also boast powerful, clear sound from the 8mm neodymium magnet drivers, and they’re so lightweight that dad can wear them for extended periods of time. To ensure a perfect fit, WoodTones come with soft silicone ear cushions in three sizes. They’re packaged in a natural hemp drawstring carrying pouch and sell for $29.99 through Griffin Technology. I love the whole idea of this. It looks great and has so many capabilities. My question is how does it sound? Hi, Nell. Don’t expect huge sound but if you want to bump it up, you can use a soundbar that plugs into the USB port or external speakers in the 3.5mm Headphone Jack. I love these turntables. Makes me wish I hadn’t gotten rid of all of my records ages ago. Oh, and these are just the newest ones, but pyleaudio.com has others as well. Thanks!